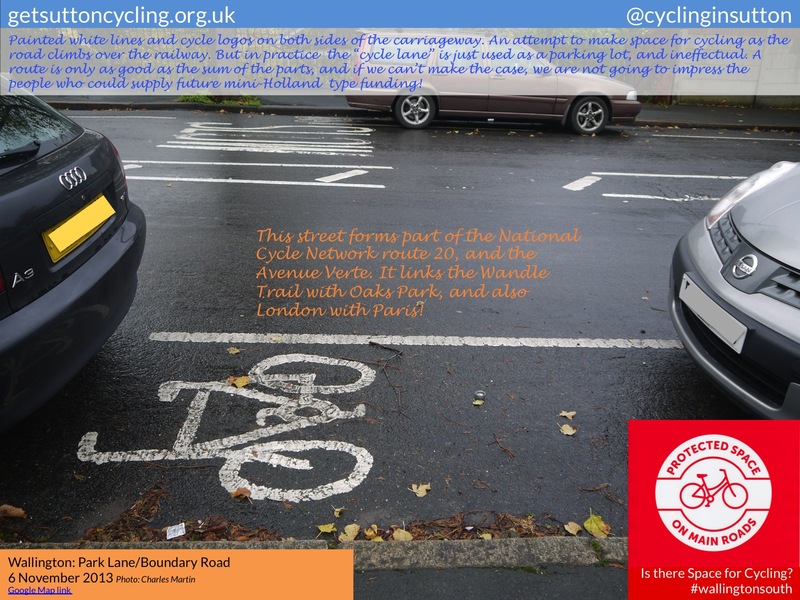 Space for Cycling, an initiative from the London Cycling Campaign , , called on every candidate in the May 2014 London council elections to support one specific action that would help to begin the process of making their local streets feel safe and inviting for everyone to cycle. 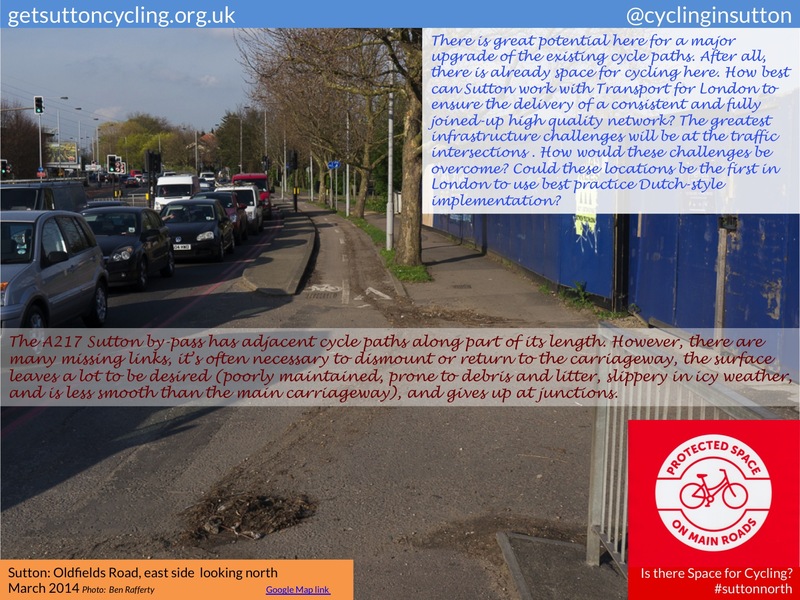 The key action points, or ‘asks’, as prepared by Get Sutton Cycling, for all eighteen wards in the London Borough of Sutton ahead of those elections are detailed here. They can also be downloaded as PDF documents from the links below. The choice of theme allocated to each ward, and the associated ‘ask’, was determined from the results of an online survey , along with the comments that were received at an open house event  held in February 2014 and attended by over 30 Sutton residents. 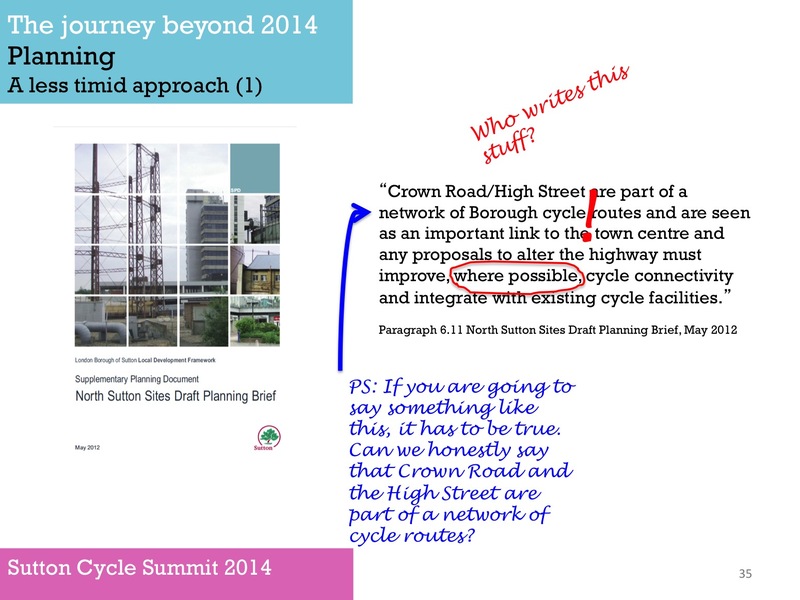 The outcomes were then compiled by Get Sutton Cycling , reviewed by the LCC, and subsequently published online at Space for Cycling . With these in place, Get Sutton Cycling held a Small Ride  to promote Space for Cycling on 3 May, prior to the London Cycling Campaign’s Big Ride  on 17 May ahead of the elections on 22 May. The criteria for the ‘asks’ were deliberately set high. The reason for this was to give a clear indication that there needs to be a step-change in provision if cycling is ever to become a mainstream form of transport. It was recognised that some candidates may consider the specific ‘ask’ to be too ambitious for them to feel able to give their outright initial support. But this was more about establishing the case, and putting in place the process that would enable the dialogue to be established with those who were subsequently elected. Given that Sutton Council controls around 95% of the borough’s roads, and that the decisions made by councillors today will directly determine the way people travel in the borough for many years to come, it was felt important to set a high benchmark in all wards. Political support for cycling in London is strong and growing. Potential funding for cycling is at unprecedented levels. Active travel is increasingly being seen as part of a healthy and happy lifestyle. And the publication of greatly improved guidance on how to deliver cycling infrastructure (to match the best available from around the world) is imminent. All in all, there has never been a better time to face the challenges and make the case for cycling. Shortly after the elections (held on 22 May), the London Cycling Campaign published a borough-by-borough overview outlining the support for Space for Cycling across London . Get Sutton Cycling look forward to getting to know all the newly elected councillors across the borough in the coming months, and it is hoped that they will join other forward-thinking councillors across London to show that each and every ward and community they represent can benefit in so many ways when there is Space for Cycling. London’s town centres and high streets are the pulse of every borough. By making them safer and easier to reach and explore by bike, we can build a more prosperous and ‘liveable’ London. We called on council election candidates to support the creation of safe Space for Cycling in and around town centres and high streets, to give Londoners the opportunity to visit the shops and local amenities by bicycle. In our borough, we are initially focusing on two centres for a cycle-friendly makeover – Sutton and Hackbridge. These locations are situated within the Sutton Central and Wandle Valley wards respectively, where new and innovative thinking is required to make them even better places to visit. The gyratory road system circulating traffic around Sutton town centre is a barrier to access to the retail and residential core for those on foot, on bicycle and, in many ways, for those using public transport too. Well-defined crossing points are required that link the High Street directly to paths or quiet streets beyond the gyratory. Consideration should be given to provide carriageway space for segregated two-way cycle-paths. Providing cycle space on the gyratory could help revive the rather sterile environment of dead frontages that currently occupy much of St Nicholas Way and Throwley Way. There were also some potentially useful ideas from Sutton’s mini-Holland bid in July 2013, which notes the severance caused by the gyratory to east-west routes. There are, however, severe limitations to north and south routes too, and these need to be addressed. In the near neighbourhood of the town centre, 20mph on residential roads would be appropriate, especially on narrow streets where vehicles are permitted to park on both sides of the road. Sutton Council is working with the community to turn Hackbridge into the UK’s first truly sustainable suburb. For a suburb to be truly sustainable in terms of transport, it really has to feel comfortable for cycling. Providing protected space for cycling on Middleton Road and on London Road, two of the busiest roads in the ward, would help with the sustainable suburb vision. There is space for the creation of a boulevard on London Road that would make cycling a safe and attractive option, but on-street parking would need to be addressed. There is space to transform the roundabout at Middleton Circle to make it feel safe for cycling, and in doing so enhance the character of the local centre. Across the ward explore options for the development of comfortable and inclusive cycle links to St Helier Hospital, the David Weir Leisure Centre, and with the soon to be upgraded Wandle Trail ‘Quietway’. London has many parks and wonderful green spaces. They are perfect places for cycling – particularly for children, families and the elderly – yet too many don’t provide good space for cycling. Considerate cyclists and pedestrians can happily get along together with the right facilities, which is why we called on election candidates to support the creation and improvement of accessible Space for Cycling through parks and green spaces. Cycle routes do not just start and end in a park of course. It is also important to consider how inviting the area around the park is for cycling, and how well cycle routes interface between the thoroughfare outside and the green space within. Carshalton South and Clockhouse ward, in the south of Sutton, which includes the wonderful expanse of Oaks Park, would be a good place to start. Oaks Park would become more of a cycling destination, and more cross-borough journeys would be made possible, if some existing links (and crossings) were greatly improved. Examples of these include Fairlawn Road to Croydon Lane, and Grove Lane to Clockhouse. There is a lot of potential for access improvements to Stanley Park High School by bicycle, and this requires a review and audit for suitability of many local streets. These include Fountain Drive, which could be re-designed as a linear park (to incorporate the link with East Drive and Dingwall Road), Woodmansterne Road (particularly at the intersection with South Rise), and Stanley Park Road (with junctions designed for cycling as a mode of transport). Main roads are often the worst places for cycling, because of fast moving and heavy traffic, yet they are crucial to so many journeys in London. We called on council election candidates to support the creation of protected cycle lanes, and the redesign of major junctions, to create safe Space for Cycling on main roads. The provision of protected space on the busiest streets, through segregation, including what is know as ‘lightly segregated’ or ‘kerbed’ cycle paths, is high on the wish-list of many people who currently already cycle in Sutton. For those who do not cycle, but who would like to, the delivery of such facilities is crucial to their decision as to whether to make cycling a transport option for them. That is why protected space, as a specific theme, features in nine of the eighteen boroughs wards: Beddington South, Belmont, Nonsuch, St Helier, Stonecot, Sutton North, the Wrythe, Wallington North and Wallington South. In some cases, notably the A217 Reigate Avenue and Oldfields Road (in St Helier and Sutton North wards), a form of protected space for cycling already exists, but considerable enhancement is required. Elsewhere, there are challenges to be overcome but also opportunities to be had. Protected space for cycling on two of the busiest roads in the ward (Croydon Road and Beddington Lane) would join-up and improve existing facilities, and help to extract maximum value for cycling infrastructure. Along with upgrades to the existing London Cycling Network route 75 (to be designated a Quietway), and the development of a new accessible Quietway in Beddington Farmlands (adjacent to the Hackbridge and Mitcham railway), protected space will provide coherent east-west and north-south routes. The provision of crossing points to Dutch standards for Beddington Lane (e.g. Guy Road with Richmond Road) and for Croydon Road (e.g. Demense Road with Church Road) are also high priorities. Elsewhere, 20mph for all on-street sections of ‘Quietways’, unless segregation is provided, would be appropriate. A cycle ride from Belmont to Sutton town centre, a distance of around 2km, should only take about ten minutes. But the only route for this journey, that does not require a considerable detour, is along the heavily trafficked Brighton Road. Protected space on this road, even if the provision of this requires, in places, land purchase from adjoining properties, is something that really needs to be explored. Transforming Brighton Road into a boulevard would enhance this gateway into Sutton, and benefit all road users and its residents. The busy district centre of North Cheam does not currently feel a particularly safe place to cycle to, or cycle through. There are few alternative route options along the alignment of London Road (A24). 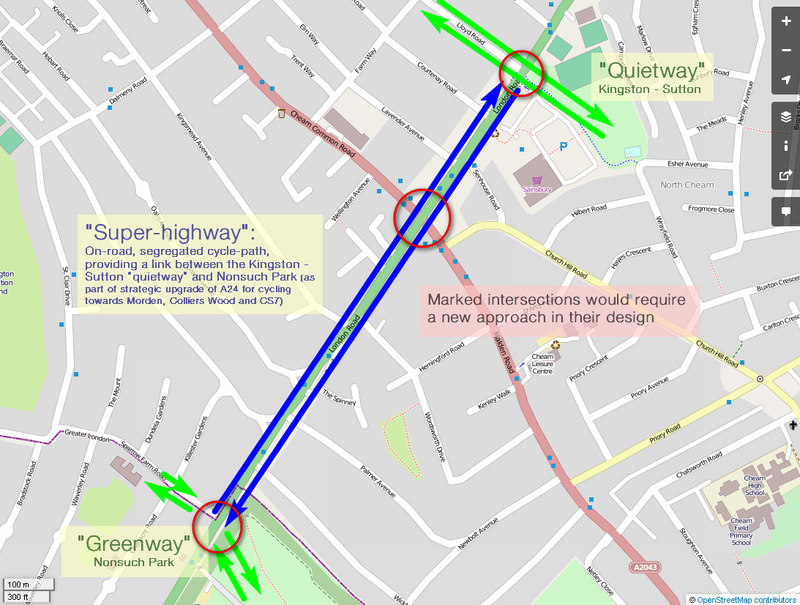 A key aspiration is to link Greenways in Nonsuch Park (including protected space for cycling at the junction of London Road/Sparrow Farm Road) with the London Cycle Network route 75 (Quietway: Lloyd Road – Fairlands Park alignment) via the centre of North Cheam. Full segregation, which continued to the north through Stonecot ward and on to Morden, would not only get many more people cycling but also reduce pressure on parking and help enhance the sense of place for this vibrant neighbourhood. A complete redesign of Rose Hill roundabout, offering safe and comfortable cycling facilities to include a fully signalised perimeter cycle path, is required to unlock the potential for cycling in St Helier. Upgraded cycle paths on Reigate Avenue (A217) and St Helier Avenue (A297), and new segregated paths on Bishopsford Road (A217), Wrythe Lane (B278) and Rose Hill (B2230) to link directly with the roundabout perimeter path. Crossings, designed for cycling as a mode of transport, are required to link areas of St Helier estate that are effectively severed by main roads. This was supported by the Sutton’s mini-Holland Bid document (paragraph 3.20 “..we will focus on increasing cycling levels …particularly on the St Helier Estate, Benhill Estate and in the Wandle Valley”). Liaise with TfL and LB of Merton. Also aspire to having safe and inclusive routes to the David Weir Arena and St Helier Hospital. Stonecot Hill (A24) forms part of a strategic link between North Cheam, Stonecot Hill and Morden. There are really no alternative route options to avoid this busy thoroughfare. 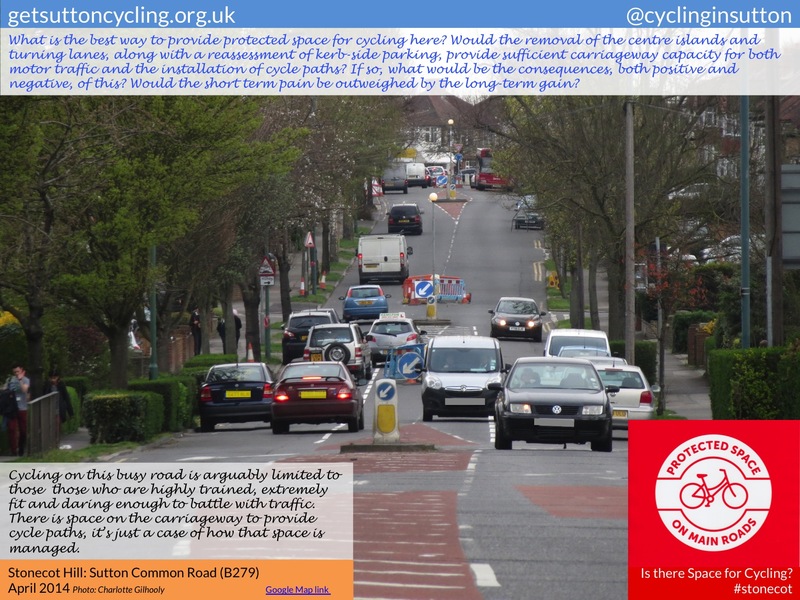 Similarly, for journeys between Stonecot Hill and Sutton High Street, it’s difficult to avoid the heavily trafficked Sutton Common Road where parked vehicles on both sides of the road, and the 30mph speed limit, make utility cycling uncomfortable. Segregation on Sutton Common Road, if linked to fully upgraded paths on A217 (see Sutton North), would help facilitate safe routes for Glenthorne High School. The school’s updated Travel Plan in 2008 (the most recent available) notes that: “The A217 and A24 generate a lot of traffic at peak times. 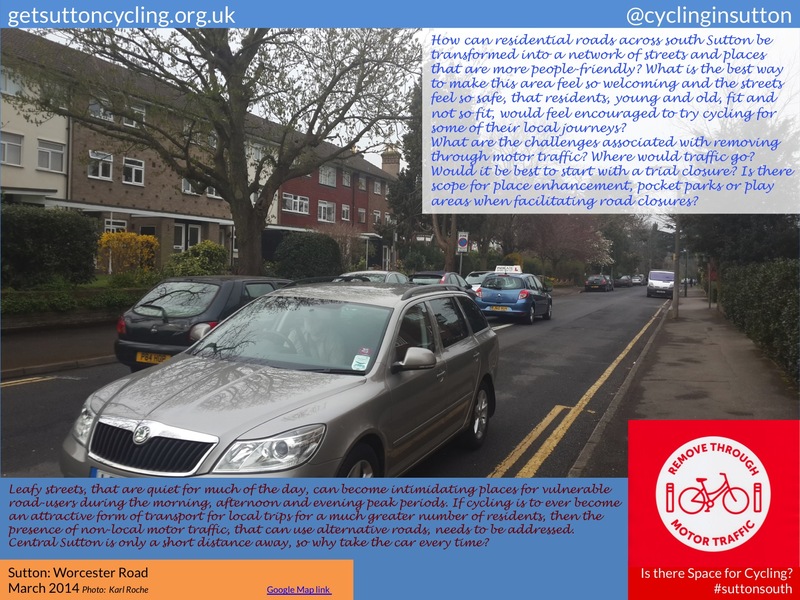 Sutton Common Road is used heavily as a link between these two roads during rush hour and regularly congested.” It identifies an on-going travel problem as “lack of cycle lanes that lead safely right up to the school gates”. There is great potential to work with TfL to provide a major upgrade to the existing, unsatisfactory, incomplete and disjointed, 1930’s cycle-path on both west and east sides of the Sutton by-pass dual carriageway (Reigate Avenue and Oldfields Road (A217)). These cycle paths will need to continue across junctions, with priority signalisation where appropriate, and be clear of parking, loading and delivery bays and bus stops. This major project will require liaison with St Helier, Stonecot, Sutton West, Cheam and Belmont wards to provide a joined-up route. Elsewhere, protected space to be provided on Rose Hill, Angel Hill, the northern section of Sutton High Street and Sutton Common Road. Protected space for cycling on Green Wrythe Lane, between Middleton Road and North Street, and on Middleton Road between St Helier Avenue and London Road would not only help create a cycling culture across the ward, but also deliver fully inclusive cycle links with the nearby St Helier Hospital and with the David Wear Leisure Centre and Arena. Improvements are required to the Colston Avenue/West Street roundabout, and these could be linked with the introduction of two-way cycling on Camden Road. Park Lane forms part of National Route 20 (London to Brighton) of Sustrans’ National Cycle Network (NCN) and is also a section of Avenue Verte (London to Paris). In theory, the NCN comprises a series of safe, traffic-free lanes and quiet on-road routes that provide a suitable cycling experience for an unaccompanied 12 year-old. The Avenue Verte is described as a largely traffic free route linking the two capital cities. As it stands at the moment, Park Lane is not even suitable for a gentle ride to the local shops. At the southern end, vehicles are permitted to park on the railway bridge in a cycle lane. 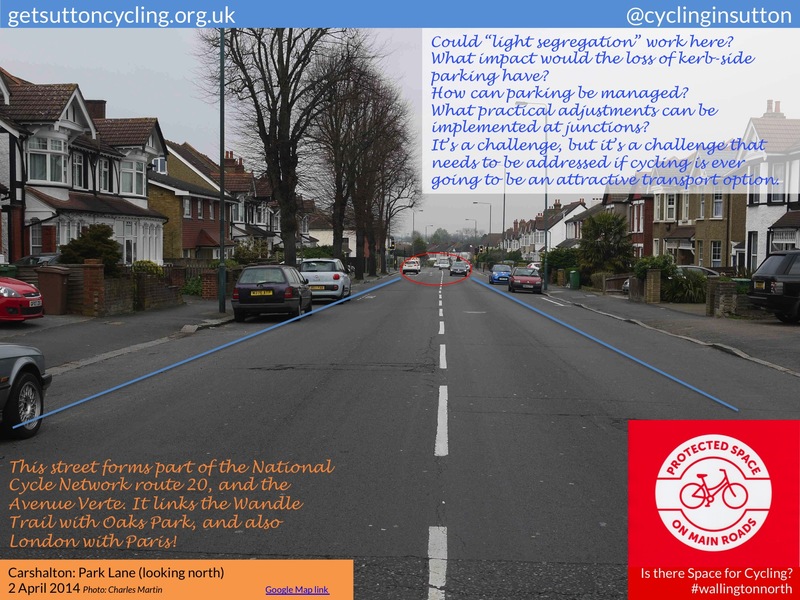 A trial of light segregation on Park Lane, from the High Street/Acre Lane in the north and continuing on to Boundary Road in the south, would make a great case study and could put Sutton firmly on the cycling map. Designed-in safety at all junctions would also be key. Protected space is also required for the A232 Acre Lane and Croydon Road, with a focus on the Wallington Green intersection (A232/A237), along with a crossing between Beddington Park and Bute Road. A trial of light segregation on Park Lane, continuing over the railway bridge and along Boundary Road to help complete a missing link in the National Cycle Network. To build on the recent improvements in Wallington town centre, develop a grid, or network, of cycle-friendly routes using quieter streets with 20mph speed limits and suitable ‘Dutch-style’ crossing points at main intersections. Streets for this network would include the quiet streets parallel to Woodcote Road with crossing points to include Stafford Road at the intersection with Clarendon Road/Onslow Gardens. A re-assessment of Ross Parade/Bridge Road/Clarendon Road/Ross Road will be required to ensure that the traffic-free Bridge Road interfaces well with the trafficked streets. To focus the function of the main shopping area on Woodcote Road as a place, rather than a busy road, introduce 20mph on Woodcote Road. Fast or heavy through motor traffic makes residential streets inhospitable for cycling. We called on council election candidates to support the removal of through motor traffic from residential streets in order to create safe Space for Cycling. Bollards and planters are an inexpensive way to remove non-local motor traffic, creating a safe environment in which to live, cycle and walk. Local residents will still be able to access their properties by car, and deliveries and refuse collections will be unaffected. Residential areas in the immediate vicinity of Carshalton Village, and residential areas close to Sutton’s town centre (with its associated gyratory system), are obvious examples of where traffic levels can be disproportionally high relative to the number of trips generated by people living in the neighbourhood. Carshalton Central, Sutton North and Sutton West wards feature in this category. Carshalton Central ward is relatively small in size. In theory it can be cycled across east-west/north-south in ten minutes. 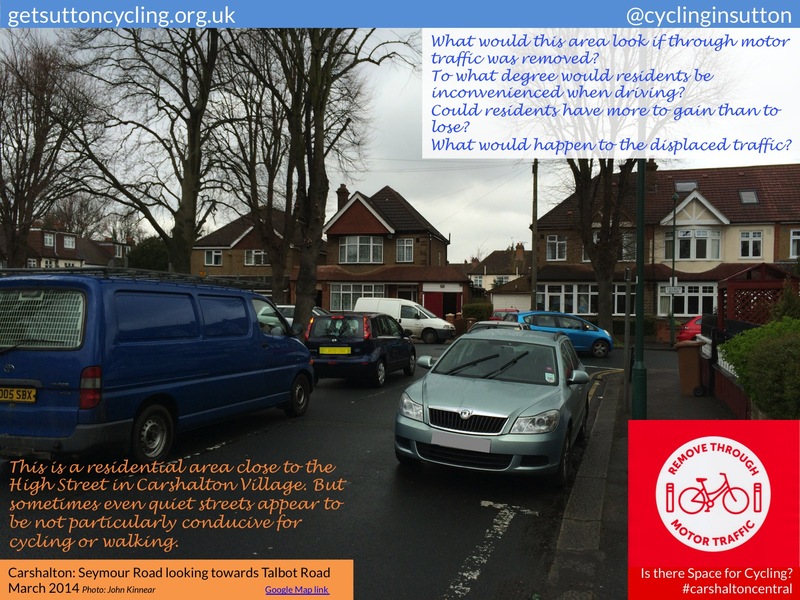 Residential roads, that should make suitable routes for cycling and are often the only alternative routes to busy, trafficked roads, can become effective no-go areas for cycling when they become conduits for inappropriate levels of motor traffic. Examples of this within the Carshalton Village Conservation Area include Ruskin Road into Seymour Road, Talbot Road and The Square. Closure of one or more of these type of roads to through motor traffic, the impact of which to those driving here would be relatively light, would help to make cycling a more attractive option for local journeys for everyone throughout the day. There are only a few locations where the railway line, linking Cheam, Sutton, and Carshalton Beeches can be crossed. One, or more, of these roads needs to be made cycle-friendly. Through motor traffic on residential roads reduces their viability for use as comfortable cycle routes. Therefore, consideration to be given to closure of through traffic on Hillcrome Road, Chalgrove Road, Grange Road, Worcester Road, Ventnor Road, with two-way cycling permitted on Devonshire Road. The cross-roads at Ventnor Road, Brighton Road, Devonshire Road to be fully signalised to provide safe and attractive conditions for cycling to and from Overton Grange School. A 20mph speed limit on all roads between Overton Road and Brighton Road would help encourage cycling too. There is very little potential for making segregated space for cycling throughout the length of the A232 Cheam Road, so explore the options for providing comfortable conditions for walking and cycling on other roads. Ideally this would include closure to through motor traffic. To the south of Cheam Road there are limited places to cross the Cheam to Sutton railway line. As a result, York Road, which was not designed for high throughput of traffic, is heavily used. To the north of Cheam Road, the Western Road/St James Road/Robin Hood Lane/Collingwood Road/Crown Road alignment is used as a short cut to avoid Cheam Road and St Nicholas Way. Consequently, with inappropriate levels of motor traffic using these roads, they become less attractive for cycling. A major upgrade to St Dunstan’s Hill and Belmont Rise cycle paths, along with Dutch-style crossing points on Quietway alignments (Seear’s Park to Love Lane, Alberta Avenue to Church Hill Road), are required. Bringing up London’s children to be healthy, independent adults is one of the most important things we can do, and helping them to cycle is one of the best ways to do it. We called on council election candidates to support the creation of safe cycle routes to schools, so children and parents have the Space for Cycling they need to enjoy making the school run by bike. It is hoped that Sutton can aspire to deliver a network of routes, initially available to schools across specific areas but ultimately across the whole borough, that will be conducive for cycling and feel safe at the busy peak times of day. Beddington South in the east of the borough, and Worcester Park in the west, are locations that have great potential and could set the standard for other wards and other boroughs to follow. To provide a grid, or network, of routes to such a high standard and quality that parents would be happy to let their children cycle to and from school. Features could include protected space on Mollison Drive and Foresters Drive, two-way cycling on streets that are currently designated one-way (e.g. Link Lane), safe junctions, Greenway cycle links between Overhill Road and Imperial Way and between Plough Lane and Lancastrian Road, the introduction of area-wide 20mph (but removal of road humps), and road closures to through motor traffic. Improvements on Sandy Lane, particularly at the junction with Woodcote Road at Woodcote Green, with a design criterion that promotes comfortable cycling, are long overdue and urgently required. Most residential streets in the Worcester Park ward are already 20mph. But many of these residential streets also carry relatively high levels of traffic, believed to be due, in part, to motorists choosing to use the side streets instead of the main roads in an attempt to reduce their journey times. 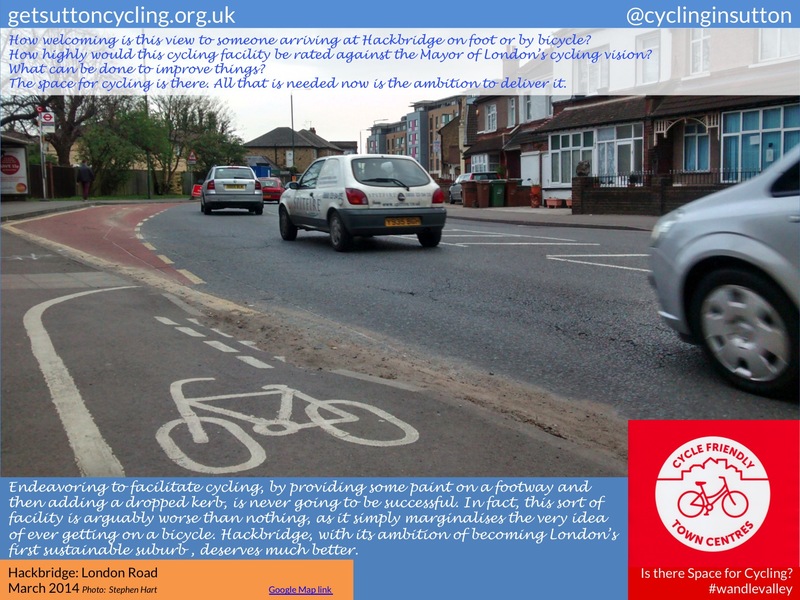 Unfortunately, in doing so, the attractiveness of cycling along Browning Avenue, for example, which forms part of the alignment of route 75 of the London Cycling Network – a route that it is proposed to develop into a cycling ‘Quietway’ – is undermined. As a result, the idea of children making short journeys from home to school on foot, let alone by bicycle, is not a particularly appealing one. The trial closure of some roads to through motor traffic (except buses) would help make local roads feel safe for cycling, and could transform how local people use their streets. Reducing motor traffic speeds is proven to prevent death and serious injuries to cyclists and pedestrians alike, especially children, with little impact on most journey times. We called on council election candidates to support 20mph speed limits in residential streets to create a less dangerous and intimidating street environment that provides safe Space for Cycling. 20mph is really the maximum speed suitable for movement on streets where large vehicles are expected to share space with people on bicycles. If there were a reduction in the default maximum speed limit from 30mph to 20mph on every council controlled street in the borough, cycling would become a more attractive transport option for many more people for some of their local journeys. This could then lead to a reduction in general traffic congestion for those essential journeys by car that, in turn, would improve bus journey times, improve the reliability and cost of deliveries, increase the availability of car parking places and make more efficient use of space. It is anticipated that 20mph will be the legal and accepted speed limit in urban areas across the UK within the next few years, so introducing it now across Sutton would simply put the borough ahead of the curve and show insight and understanding by councillors. In the meantime, on streets where the opportunity to provide protected space for cycling is limited, where it is not practical to remove through motor traffic, and where there are few options for parallel, alternative, direct “Quietway” cycle routes, the introduction of signed-only 20mph would be an appropriate intervention. The A2043, Malden Road, between Cheam and North Cheam, in Cheam ward, is one such route. Cheam Village has a historic core, but could be at the cutting edge for enhancing its character and sense of place through the introduction of a 20mph speed limit across the ward. The route option between South Cheam, Cheam Village and North Cheam is largely confined to Sandy Lane/Burdon Lane, Station Way and the busy Malden Road. Therefore, a 20mph speed limit would be appropriate on these roads too if it were determined that protected space was not viable here. Engagement with TfL to significantly upgrade the cycle paths adjacent to St Dunstan’s Hill, with signalised cycle facilities provided to a high quality where Quietways cross the A217, are crucial infrastructure requirements. With Dutch standards applied, the completion of this major project would ensure that Cheam becomes a super cycling-friendly place for residents, businesses and visitors alike. Get Sutton Cycling contributors who helped finalise the action points included John Kinnear, Charlotte Gilhooly, Ben Rafferty, Chris Rutland, Karl Roche, Charles Martin, Stephen Hart, Victoria Couchman, Gary James and Dmitri Gourkine. 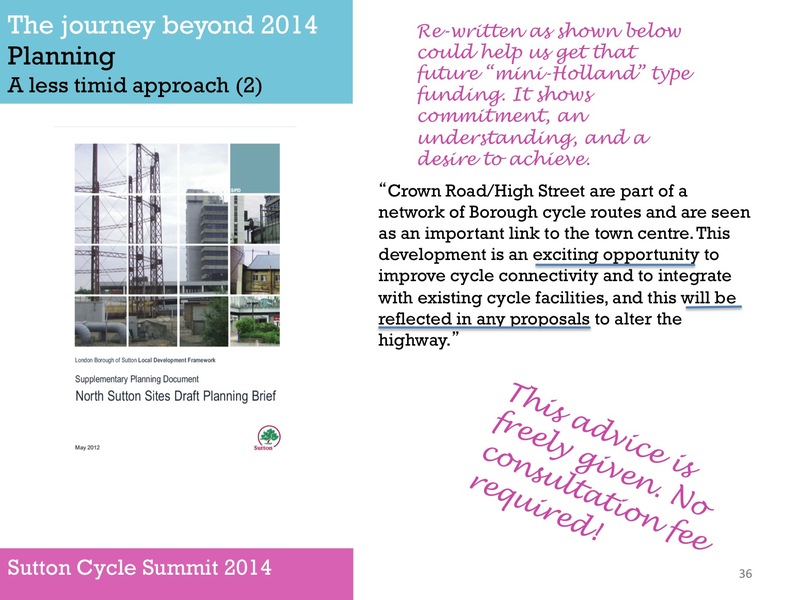 Print versions of Space for Cycling: action points for Sutton are available as PDF documents from the links below. The infrastructure on the A217 is woefully inadequate. It needs to be properly segregated and protected, and NOT be shared use with pedestrians. It also needs to keep priority over side roads. Agree completely hushlegs! Even though we recognised that the A217 was the responsibility of Transport for London rather than Sutton Council, the requirement for a major upgrade to the adjacent cycle path features strongly in the Space for Cycling ‘ask’ for councillors in Sutton North ward, and is also mentioned in the ‘asks’ for Cheam, St Helier, Stonecot and Sutton West (i.e. locations along the A217’s alignment). I began the conversation about the A217 cycle path with Transport for London last year, and followed it up in January. A regular user of the A217 cycle path contacted me (and TfL) in April, noting that the main carriageway had recently been resurfaced to “billiard table smoothness” but the adjacent uneven and rutted cycle path had been left untouched. TfL gave an initial reply in May, but I am still waiting to hear whether there has been a follow-up. Next week I expect to get the opportunity to talk with one of TfL’s senior cycling technical specialists, and the woeful A217 cycling infrastructure will get mentioned (and, furthermore, the specialist will get invited to come and have a look). Hope we will be able to report some progress on this in the not too distant future. Thanks for commenting on this hushlegs. It all helps, and is much appreciated.